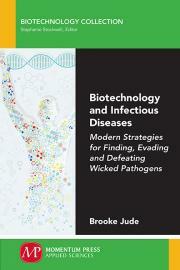 The book begins with an introduction to the pathogenic mechanisms displayed by various diseases. Pathogen descriptions of are followed up by such topics as use assays for low- level detection, application of nanosized agents for drug delivery, and design of vaccines for emerging infections, including Ebola and Zika. New technologies are being developed as fast as infectious evolve. The key to taming these wicked pathogens will be in finding commonalities between organisms and applying biotechnological advances. Brooke A. Jude is an assistant professor and program director of biology at Bard College in Annandale-on-Hudson, NY. She received her AB from Colby College, in Waterville, ME and her PhD in microbiology and immunology from Dartmouth College in Hanover, NH. At Bard, she teaches courses on microbiology, genetics, and infectious disease. Research in the Jude Lab is primarily focused aquatic, violacein producing microbes of the Hudson Valley, and beyond. In the lab, experiments answer phenotypic, genetic, and genomic-focused questions.